OldTown White Coffee Australia owner, Mun Soon, says his company plan to establish 40 eateries throughout Australia in the next decade. MELBOURNE: Australia's first OldTown White Coffee outlet officially opened here yesterday to the beat of Chinese drums and lion dance that brought busy midday Elizabeth St to a standstill. A packed restaurant looked on as Malaysia's Consul-General in Melbourne Datuk Dr Mohd Rameez Yahaya cut the ribbon while throngs waited at the door and pedestrian walkway for their turn to enjoy the special feast that was prepared to mark the inaugural event. Among the guests were Domestic Trade, Co-operatives and Consumerism Ministry secretary-general Datuk Seri Alias Ahmad, who was here with about 13 Malaysian franchisees to promote their products at the three-day Franchising and Business Opportunities Expo 2015 which ends today. Malaysian favourites such as Ipoh Hor Fun, curry laksa, prawn mee and nasi Lemak were on the menu. Its owner, Mun Soon, an architect here and CEO of OldTown White Coffee, Australia, said his company planned to establish 40 eateries throughout Australia in the next 10 years. 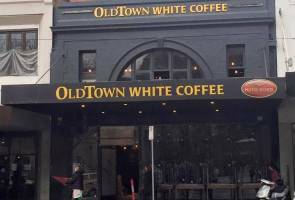 Mun Soon, a former student of Anderson School, Ipoh, said it was a big step for OldTown to break in to the Melbourne market, which is the coffee capital of Australia. Let's Talk: Diana Chan - World's Your Oyster? Let's Talk: Poster Girl for the Australian Dream?